Victoria's embattled police chief has stepped aside as the RCMP and two retired judges oversee multiple investigations into a growing social media scandal. Police board co-chairwoman and Esquimalt Mayor Barb Desjardins told reporters that Frank Elsner informed the board he will remain off the job until the investigations have been concluded. They were sparked after the chief admitted that he was "truly sorry and humiliated" for taking part in inappropriate social media exchanges with the wife of one of his officers. But in the weeks since then, British Columbia's police complaint commissioner Stan Lowe has been digging deeper into the file. On Friday, Lowe announced investigations into allegations of disciplinary breaches of public trust and discreditable conduct, saying he had called in the RCMP. Desjardins said deputy chief Del Manak will immediately become acting chief. "It's tragic," Desjardins said. "I know the community is concerned. I know there are members of that police department who are hurting." A notice for investigation issued by Lowe alleges Elsner provided misleading information to an investigator and contacted a witnesses during an internal investigation, including the officer whose wife the chief had messaged over Twitter. "I think the commissioner described that he feels these allegations are extremely serious," said deputy police complaint commissioner Rollie Woods in an interview. "That's the way we are treating it." Elsner has not been available for comment. He apologized on Dec. 6 after a police-board investigation found Twitter messages he'd sent to another officer's wife were inappropriate. Lowe said in a statement that he received more information last week from Victoria's police union about four employees alleging workplace harassment by the chief related to ongoing conduct starting in early 2014. In addition to asking that the chief's conduct be investigated by the RCMP, Lowe has asked retired judges Carol Baird Ellan and Ian Pitfield to look into the separate allegations and decide whether misconduct is involved. Lowe set out five aspects in his order for launching an external investigation against Elsner, saying that if substantiated, they would constitute misconduct. He said that could mean Elsner engaged with the spouse of an officer under his command, provided misleading information to an investigator and contacted a witness during an internal investigation. Woods said the decision to proceed with the internal investigation includes allegations that Elsner contacted a Victoria police officer about his wife and provided the officer with information that convinced him a further investigation was not required. "Information provided later on in the internal investigation report suggested that the chief constable provided misleading information to his member that contributed to him making the decision not to ask for an investigation," said Woods. Lowe said in a statement that there is an overriding interest in going ahead with the investigations as a matter of public trust. "The climate within the department appears to be in a state of tension and dissonance." "The public must have confidence in the effective and efficient operation of a police department: harmony and discipline within the workplace have a direct impact on its operations." The Victoria and Esquimalt Police Board was notified about a concern involving the chief during the summer and hired a lawyer to investigate. Although the investigation found his use of social media was inappropriate, the eight board members met in early December and decided the chief still had their "full confidence." The board provides civilian oversight of the Victoria Police Department. Elsner said after the board meeting that he should not have sent the messages. But he said the investigation concluded there was no inappropriate relationship between himself and the woman to whom he sent messages. 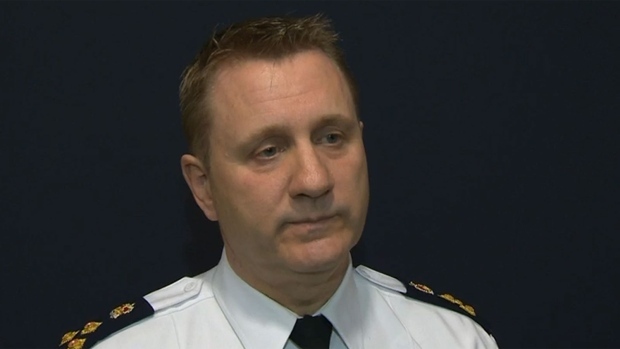 Soon after Elsner apologized, the union representing Victoria police officers called for him to be removed from his post after the "betrayal" of trust. Acting union president Sgt. Glen Shiels said that while the incident itself appeared to be on the low end of a breach, the fact that Elsner messaged the wife of a police officer undermines the trust of all his officers. The member's wife is reportedly a police officer in a neighbouring jurisdiction.